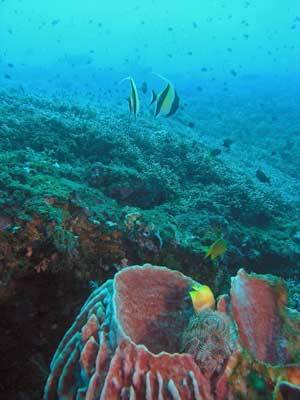 Kubu Reef is located to the north-west of Tulamben at another little town/village called Kubu. 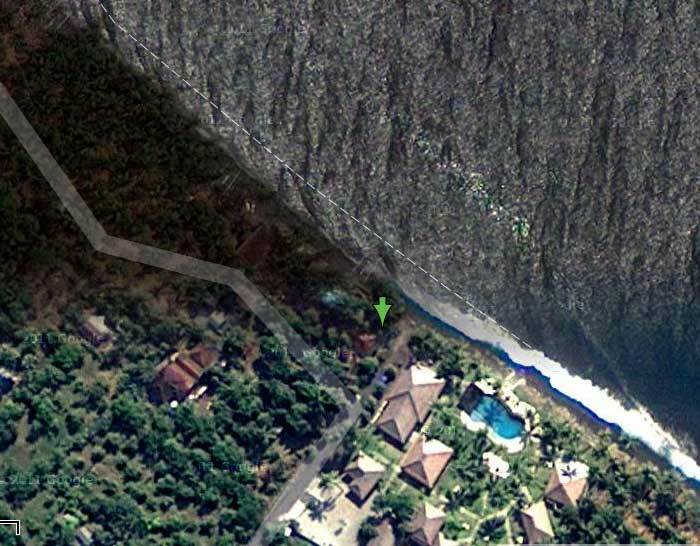 It is about three kilometres from Tulumben to Kubu. 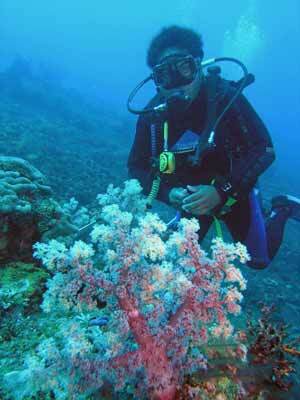 The dive site is located down a lane that leads to two resorts, One of which is called Relax Bali. A GPS mark for the dive spot is 8° 14' 56.8"S 115° 34' 26.1"E (using WGS84 as the datum). For this site you load all your gear into the shop's ute and then climb in the back yourself. You are driven to Kubu and down to the beach. As you approach the end of the lane, a little old man who looks about 100 years old (but is probably only 50 or 60) runs from 50 metres up the road to the ute. Soon the ute is surrounded by this bloke and what appears to be his family, including an old women who I assume is his wife. The whole family grabs all the dive gear, tanks, weight belts, boxes of fins etc and carry them the short distance to the concrete retaining wall to the north of the lane. I assume that these people "own" the rights to be porters for this site. There is just enough room for the gear and for the divers to get ready. After putting on your wetsuit, the old bloke helps you put on your BCD and then you walks down a short set of steps to the rocky beach. Like the other sites care needs to be taken when entering and exiting the water due to the size of the rocks. 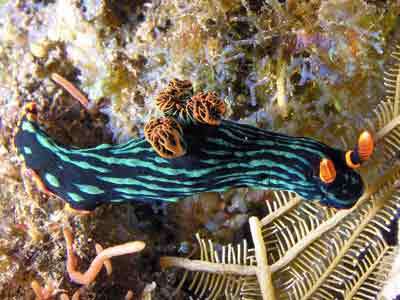 Once in the water you put on your fins and drop to the bottom. Here the rocky beach extends out a lot further than the other sites, so you cross rocks for a while before encountering the black sand. 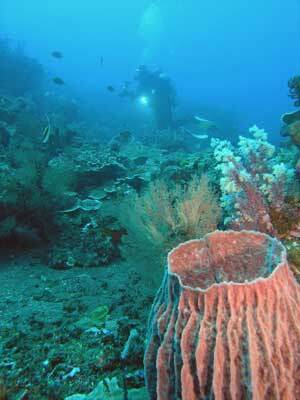 There are two dives here, Kubu Reef Right and Kubu Reef Left. 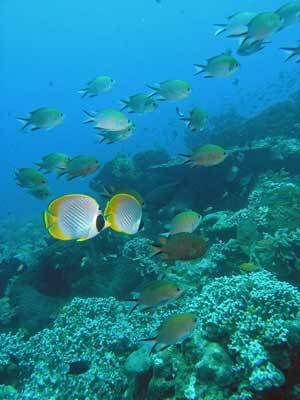 When you come here you will probably do two dives (the ute will head back to the dive shop after dropping you off). The first dive we did here was to the right of the entry spot. We headed down a sand ridge to almost 30 metres. Like the other sites, there are some very small coral outcrops along the ridge. 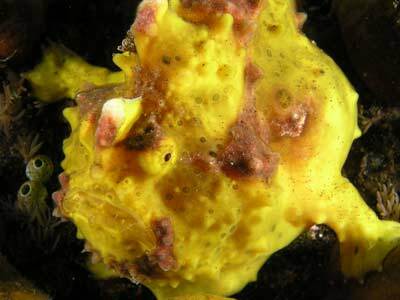 As we went down, at six metres there was a larger yellow anglerfish with reddish patches and greyish spots. As we descended we see a very large coconut tree in the gully to the left. 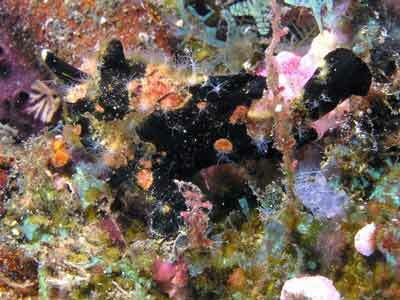 As you get deeper the ridge becomes more substantial and is like a normal coral reef. It ends up with a small wall that drops to well over 30 metres. The wall turns to the south. 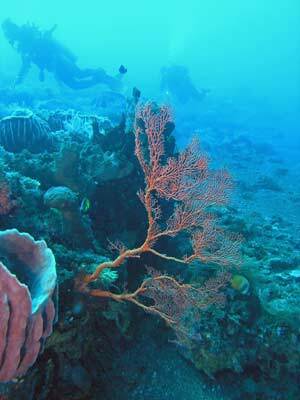 There are large gorgonias and barrel sponges and soft corals. 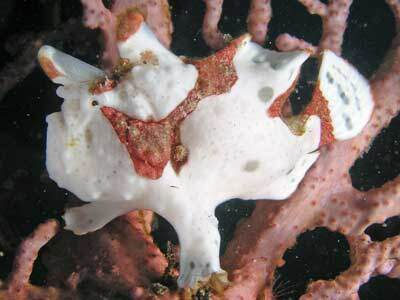 There are many soft coral crabs on the soft corals, some nudibranchs and a brilliant dark nudibranch with green lines and bright red rhinophores. Over the next 40 minutes we very gradually ascended back to the beach. We went left and then right as we explored the area. 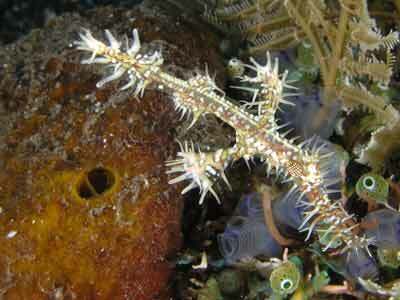 There were many other things to see, including ornate ghost pipefish and interesting shrimps on sea whips. As we exited the water, the old man came into the water to assist. He had no shoes and grabs you under the arm and steadies you as you gingerly walk over the rocks. Even once out of the water he assists you back to the concrete. In between dives the guide swaps over the tanks. Take some money with you so you can purchase a cold drink from the Relax Bali resort bar which is next door. There is also a cold water shower where you can wash off the salt. Take a bag with a towel and sun cream as well as for other items. Security is safe as the family watches over your gear while you are in the water. The second dive here is to the left of the entry spot. It is much the same as the right side. 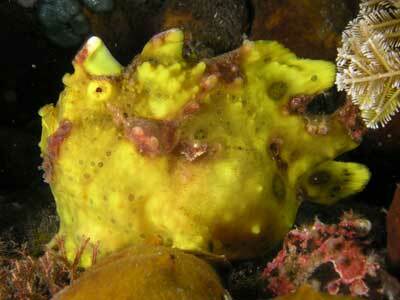 In fact, you can visit the yellow anglerfish as you head down towards the reef. This time you follow the gully down rather than the ridge. 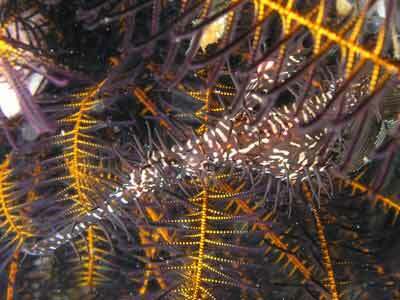 After a short distance you cross to the ridge to the north-west of the one dived before. In one spot there was some sort of mooring line running up towards the surface. 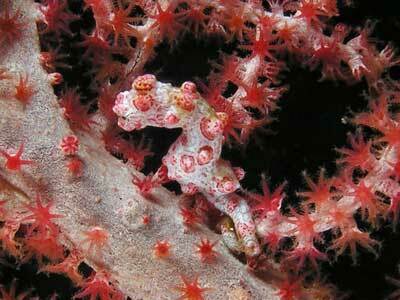 Under this there was a tiny black anglerfish, two ornate ghost pipefish and on a gorgonia, another anglerfish. 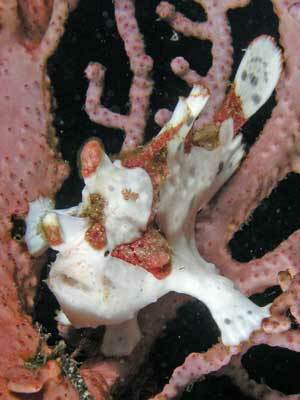 This anglerfish was a tiny white one with reddish patches and orange edges to its fins. What a great little spot! 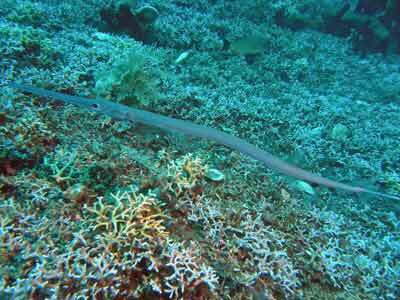 This dive has less reef and more sand and is not as steep as the right side. However, it still goes to over 30 metres. 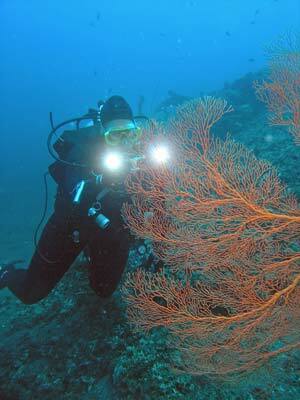 There are lots of gorgonias and huge barrel sponges. From the deeper section you gradually ascend up the ridge, zig-zagging as you go, staying out of decompression. 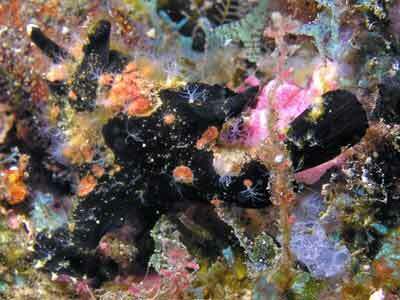 Further up we saw some interesting shrimp on featherstars and many species of nudibranch. 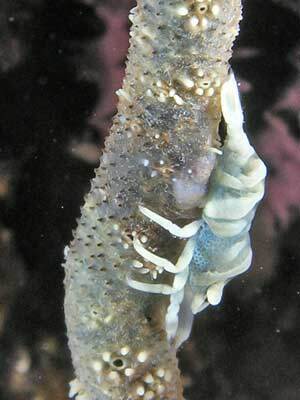 The end of the dive is spent in five to six metres exploring all the same bits as the first dive. As you exit the water, you are again assisted by the old man. Once out of the water, all your gear is packed and once the ute returns, loaded in by the family. A cold shower refreshes and removes the salt. These were both excellent dives, with the old bloke adding a lot of great entertainment to your surface interval. He even insisted on having his photo taken with Kelly and another female in our group. The visibility was probably 30 metres and the water temperature was about 27ºC. Click here to see the dive profile from my computer for the first dive and here for the second dive .